*I was sent a set of the new Rubbermaid Flat LunchBlox to facilitate my review. All opinions and weird lunch choices are my own. Diva carries her lunch to school every day. Every. Day. But my sweet baby girl doesn't get the average sandwich, apple, & bag of chips. Because of her odd interesting lunches, she almost always is in need of a microwave. Thank goodness her school has one the students can use. Whatever I put her lunch in, it needs to be microwave safe because what I don't intend for her to have for her lunch is melted plastic. Diva's lunches are often saucy or juicy so her containers need to have tight fitting lids. I reviewed a set of the Rubermaid LunchBlox when they first came out and thought they were great but that the grooves that lock them in place were not tight enough and therefore the blox didn't hold together all that well. Rubbermaid must have read the reviews since these blox hold in place much tighter on the ice tray. The LunchBlox Kids Flat Kit is currently available for purchase at Rubbermaid.com, Target, WalMart and grocery stores with the suggested retail price being $14.99. But this week (8/7-8/13/13) Brookshire's has them on sale for $9.99 and you can use this $2 coupon to get it even cheaper! The good news keeps on coming since the fine folks at Rubbermaid have given one of my readers a chance to win a set of these cool cubes for themselves. 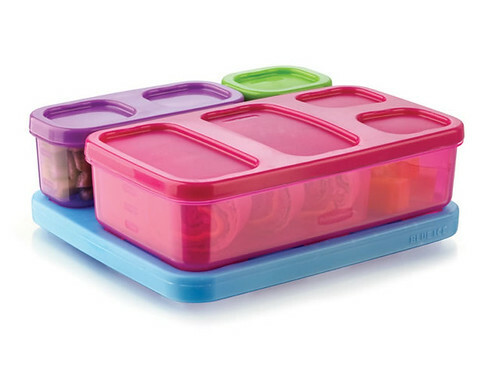 Enter for a chance to win a Rubbermaid Lunchblox Flat Kit. The LunchBlox will be sent from Rubbermaid to the winner. US and Canada entries only please. Winner will have three days to respond before another name is drawn. Good luck! The winner has been contacted. My husband is just starting to bring a lunch to work with him instead of just buying fast food. His lunch will mostly be left overs. This might just work. My kids don't like anything too "weird" but something kind of different might be pistachios sometimes and of course a cute little lunch box note. My oldest doesn't eat bread so I have to send some interesting lunches myself. Some of her favorites besides leftovers include cheesy rice, lunch meat with cheese in middle (then melted), salad, and corn tortillas with melted cheese. Hmmm.....now that it's in writing, I'm noticing a lot of cheese! Those look awesome! I like to pack food in fun containers when we go out with the kids. These would be perfect. I havent packed anything yet. Just getting started. My daughter is too young to pack lunches yet, but once I do, I would love to do bento-type lunches with her food shaped like animals/fun things. Nothing weird. Lots of deli meat, cheese, and fruit. This is going to be the first year of me packing my sons lunches since he will be starting Kindergarten this year. The weirdest thing I pack in my son's lunch is probably vienna sausages. My oldest used to take pancakes and syrup sometimes, other times he would take precooked bacon and hard boiled eggs, dry cereal, a milk tetra pack and fruit... My kids don't eat deli meat, so I need to be creative with cheeses and stuff. No peanut butter allowed at school unfortunately, which is the only sandwich my children eat. I would have to say fried pumpkin seeds is the weirdest thing I have put in their lunches! German licorice as a dessert! Not sure about weird - maybe smoked salmon? Pickles. but he loves them!!!!! Other than little notes from me?? Well, roasted beets I think would qualify! My son hasn't started school yet but I pack my husband's lunch. I don't really pack anything that I would consider weird in his lunch. I pack Marshmallow Fluff. Yum! kristiedonelson(at)gmail(dot)com Thank you. I don't pack my littles lunch - she's only 2 - but I often pack dinner to class with me. Weirdest was kraut and kielbasa. My classmates were not pleased! My son prefers fresh spinach to chips as a sandwich side. That is probably the "weirdest" thing I ever packed for him. if you can call that weird. The weirdest thing is apple slices and cheese to eat together. an MRE for my nephew as a joke he was in middle school and knew what to do with it. i also added 5 bucks taped to the back encase he was not in the mood for a joke. I packed a hot dog for my son this week! I don't pack anything too weird but he does love Lucky Charms so sometimes he gets a little baggie of those! My grandson still likes to have cheerios & raisins! We don't pack anything too weird, just lots of olives and dried fruits. Nothing weird, my son is suuuuuuuuper picky! I have yet to pack my child's lunch. He starts school in a few weeks, but I can't imagine putting anything too crazy in there. Of course, who knows?